Dirt Oval is the perfect place to host your next birthday party! The race fan in your life will cherish the memories made during this unique birthday party celebration. Party packages are available for Team Demolition Derby, Monster Truck Mayhem and Eve of Haunted Destruction events. Only a limited number of spots are available for the whole season. 1 General Admission event ticket per-person to the selected event. Dirt Oval t-shirt for birthday guest of honor. Hot dog & pop per-person. 30-minute meet & greet with birthday guest's favorite team / driver. Birthday guest receives an exclusive ride in a pre-race vehicle for the national anthem. Roped off area on concourse level with table for party. Birthday party must provide their own cake. Price per-person is $25. Minimum of 12 guests required to book party. 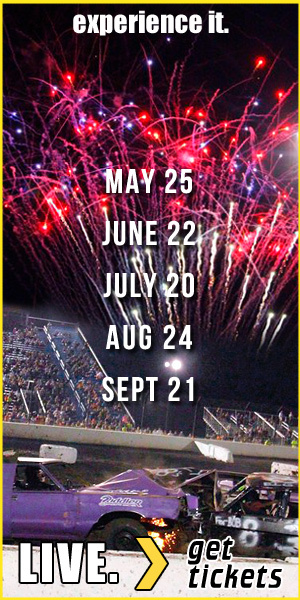 Contact the Dirt Oval office to secure your party spot or use the form below!